I invited my parents (and my roommate’s parents) to dinner this weekend as my way of saying thank you for tolerating the obscenity of Manhattan rents. It struck me as a bit odd that we never had them over when we were living in our old apartment, but of course, this year’s abode is much more suitable for entertaining (translation: it is actually big enough to put real furniture in). Anyway, the menu for the evening is as follows: spinach and tomato timbales, roasted chicken with garlic, a sort of eggplant-and-peppers dish (aside: I love eggplant, and my mom makes this Sicilian dish called caponata, and I think it is probably one of the best things I have ever had. ), fougasse, and, for dessert, a fig and raspberry galette, which I will post a recipe for tomorrow. This menu basically made my kitchen smell like the lyrics to Scarborough Fair (“Parsley, sage, rosemary and thyme…” + GARLIC!). Fougasse is the Provençal variation of the ever-popular foccacia – a traditional Mediterranean flatbread. Fougasse is more likely than foccacia to have additions, such as cheese, olives or anchovies, although I have left these out. 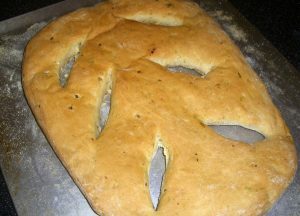 One fougasse feature that I really like is that it is common to slash it to resemble an ear of wheat. Typically, I avoid making things with yeast in them because I am too impatient to wait for things to rise but, having tasted the final product, I’m glad that I did this time. Although, I should add that there was a panicked phone call to my mother: “Mom, I don’t think the yeast is foaming! Oh, wait, it looks like it’s making little mushroom clouds, fun! Oh, no, now it’s flat!” “I’m sure it’s fine.” “No, I don’t think so, it just looks like milky water, it’s not foamy at all, I think I need to do it over, because it says that the water should be between 105 and 115 and my thermometer says it’s only 102!” Result: it was fine. 1. In a small saucepan over medium heat, combine the garlic, rosemary, oregano, thyme and olive oil. Bring to a simmer and cook until the garlic is tender, about 1 minute. Remove from the heat and allow to cool to room temperature. 2. In a large bowl, dissolve the year in warm water and let stand until foamy, about 5 minutes. Add the oil mixture, flour and salt and stir with a wooden spoon until the dough comes together in a rough ball. Turn the dough out onto a clean, lightly oiled work surface and knead until the dough is elastic and no longer sticky, about 5-7 mins. 3. Shape the dough into a ball, transfer to a lightly oiled bowl, and cover it with a clean dishcloth. Let it rise in a warm spot until it doubles in bulk, about 1.5 to 2 hours. 4.. Punch down the dough and turn it out onto a clean work surface. Cut it in half using a sharp knife, and shape each piece into a loose ball, cover with a dry towl, and let rest for 5 mins. 5. Dust 2 half-sheet pans or baking sheets with semolina four. On a lightly floured surface, roll out each half of the dough into a rectangle about the same size as the prepared pans. Transfer each rectangle to the pans, spreading them with your hands if it shrinks. Make 6 slits (3 on each side) pointing towards the center of the dough. Gently pull on the dough to widen the slits into ovas. 6. Cover the dough loosely with a towel and let it rise again until it is doubled in bulk, 25-30 mins. 7. Position a rack in the lower 1/3 of the oven and preheat it to 425oF. Bake the breads until they are lightly browned and sound hollow when tapped on the bottom, 15-20 mins. Tranfser to wire racks and let cool completely in the pans. When I came back from Costa Rica, I bought some plantains, intending to make some fried plantains. Sadly, the plantains were not yet ripe enough for this venture, and by the time that they were, I was no longer in the mood for fried plantains. Now I was left with some overripe plantains that I did not particularly want to eat. Instead, I decided that I would whip together some banana bread in mini-loaf pans and distribute it to people! 1. Preheat the oven to 350oF. Butter and flour 2 large loaf pans. 2. In a bowl, stir together the flour, baking powder, baking soda, cinnamon and salt. In a large bowl, beat together the butter and brown sugar on medium speed until creamy. Add the honey and beat until blended. Add the eggs, increase the speed to medium-high, and beat until smooth. Add the dry ingredients to the wet ingredients in 2 additions, alternating with the mashed bananas. Beat on medium speed after each addition until smooth. 3. Spread the batter evenly into the prepared pans. Sprinkle with nuts, if using. 4. 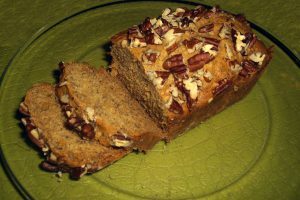 Bake until a toothpick inserted into the center of the loaves comes out clean, 35-40 minutes. Let cool in the pans on a wire rack.